Captain Kelly Stillwell smiled a knowing smile as both outdoor writer Terry Gibson and Orvis News Editor Phil Monahan fought their respective battles side by side on Stillwell’s skiff. Stillwell, owner of Tide Tuit Light Tackle and Fly Fishing Guide Service and an experienced saltwater guide operating out of Sarasota, Florida, had seen this type of dueling action before. Earlier that morning he’d picked us up at the docks behind the Hyatt Regency Hotel. (A two-minute walk from your hotel room to your guide? Priceless.) In the end, though the Spanish mackerels fought the good fight for freedom, Gibson and Monahan prevailed. We quickly snapped a few photos and then released both prizes to live and fight another day. 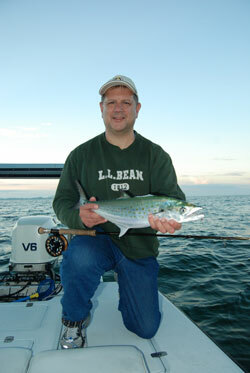 Outdoor writer Terry Gibson about to release a Spanish mackerel landed at the TRCP Sarasota conference. I myself had caught my very first Spanish mackerel on the fly earlier that morning, and consequently I was the only person on our boat happier than Stillwell. Watching the action from a nearby boat was former Fly Rod and Reel Fly Angler of the Year and author Tom Rosenbauer, “testing” a new Orvis fly rod. Behind Rosenbauer, who was soon into another good fish, a small flotilla of recreational anglers, outdoor writers and editors, and fishing industry leaders bobbed in similar boats, landing everything from cobia to grouper. No doubt Stillwell and his fellow guides gave thanks for a good day on the water and a willing ocean full of healthy, hungry, and hard-fighting fish. We were gathered at Mote Marine Laboratory in Sarasota for the second annual Theodore Roosevelt Conservation Partnership (TRCP) Saltwater Media Summit. TRCP had convened the summit—and invited outdoor writers and editors from both traditional and fly fishing publications as well as columnists like Pulitzer-Prize-winning newspaperman Bob Marshall—to highlight the challenges facing our marine resources. Major sponsors of the event included Take Me Fishing, Florida Lottery, American Sportfishing Association, and the Outdoor Industry Association. Manufacturers such as Orvis, Costa, Patagonia, Pro Guide Direct, and Pure Fishing also contributed to the event, as did Visit Sarasota County and Connie Parker. Participants didn’t spend all their time fishing, either: Instead they discussed fisheries management, insufficient funding for research involving many threatened species, marine reserves, ways to raise awareness among elected leaders of the importance of managing natural resources, and the Bill Fish Conservation Act. Officials at TRCP believe that the outdoor media can be the bridge between outdoor enthusiasts, who financially support, utilize, and enjoy natural resources, and the policymakers who manage those resources. 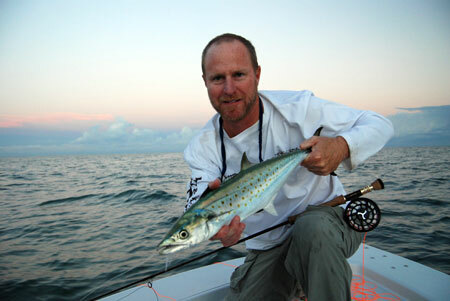 By educating anglers and other outdoor enthusiasts about conservation challenges and how “they can get involved to help conserve our marine fisheries,” Mullins argues that outdoor writers connect these better informed citizens with lawmakers who can act to preserve resources for future generations. The TRCP began their media summits in 2003, when they focused on freshwater challenges in Western rivers. The organization has grown steadily and is now recognized as an influential voice in public policy decision making. Headquartered in Washington, DC, the TRCP’s interests extend beyond marine resources management to the responsible use of public lands to hunter and angling access and usage. To learn more about how your company can sponsor TRCP’s next media summit or to learn how TRCP’s mission aids everyday sportsmen, check out their website at www.trcp.org.